It is mid-September and so I have prepared for the possible cold weather up in Algonquin Park. I have two wool blankets, and a sleeping bag rated to about -18° Celsius. I should be fine. 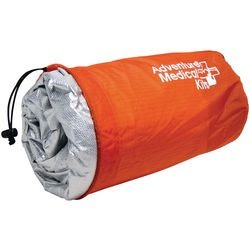 But to be certain, I am also bringing along my "Adventure Medical Thermo-Lite II Bivvy Sack". 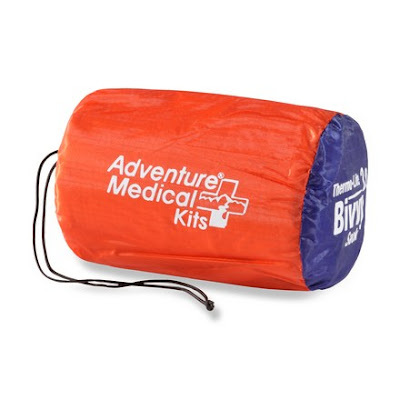 This mini sleeping bag / emergency sack weighs about 200 grams - less than half a pound. Dimensions are about a metre X 2 metres - (1 X 2 yards). It packs into a cylindrical stuff sack about the size of a tall-boy can of beer. I bought it online last year for about $22 Canadian. You can buy it at Mountain Equipment Co-op for $32. One evening I slept in it in the back yard, back in May. It was quite cold still then. I opened it up, crawled in and immediately began to feel warm. The aluminized, baffled fabric seemed to reflect back most of my heat. It seals with Velcro, and gaps between the two layers allow for humidity to blow away, preventing condensation. This should be in everyone's car (if you live in Canada), at the very least. It is sturdy, warm, compact and easy to carry. It won't get soaked like a sleeping bag, so it will potentially save your life in case you tip over out of your canoe - of course, assuming that you keep it close at hand. It is small enough that you could loop it to your knapsack, or even to your belt.